So they decided to do something else with Primals. However, there's no reason why something like this couldn't and even should done based on Ancients instead of Primals. Read the following topic using Deckard's Cain voice and always replacing the word "Primal" with the word "Ancient". There would roll a random rune in front of Primal's name, like "Tal Primal Ancient Warmonger". Could be any other rune as well. NOTE! 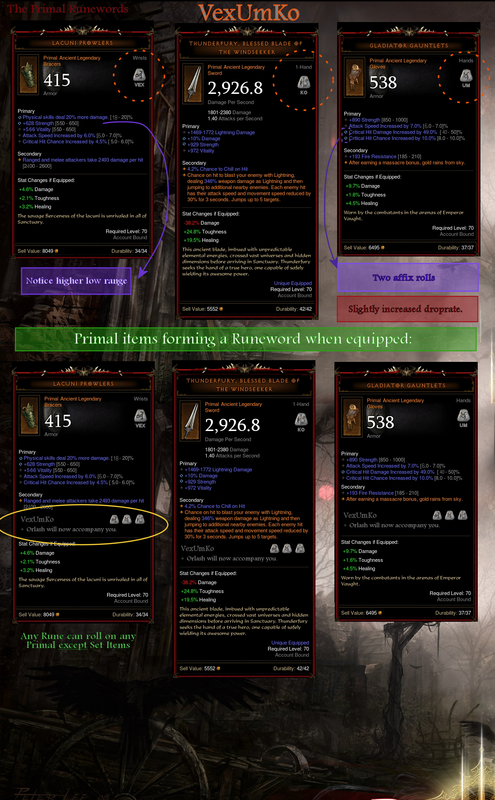 One rune (one Primal) can crossover multiple Runewords if the rune exists in both. but still near the highest stats and maybe with 2 stat rolls. Primals could have now a slightly increased droprate. Every salvaged Primal would now yield a imbueable Rune. Blizzard copyright images used to demonstrate a suggestion. Scroll down for a Relicword alternative. so that a Runeword is formed, the character is granted with a runeword. 5% better chance to find Ancients and Primals. Combos and depth are endless. The propablity to roll the most optimal Primal gear with desired runes is very small so everyone would have to think by themselves what to do with the build. Imagine the Ourobros rolling with a good rune and you would equip it thanks to that. Not used legendaries would have chance to be used. The original topic: Battle.net Diablo 3 PTR forums Including a lot of Runewords and deeper explanations. "There would be anyway one build that rules them all"
Was the most common complain I heard about. It's true, but taking how rare Primals are, it's extremely unlikely that you would ever get the desired combo of the most optimal Primal legendaries and runes imbued to them. "It's just RNG on top of RNG"
We have basically 8 - 10 piece sets as every 6 piece sets have such a mandatory supporting legendaries. There's pretty much no viable Marauder6 without Bombardier's Rucksack or no viable UE DH without Yang's Recurve and so on. I'd love to have this mixed up. It'd so exciting to know, that our set-in-stone builds had a possibility to be overwhelmed any time by the drops. Now be basically wait for a better Ancient that has 1% more of something. And that's so boring. The most important aspect with the Runeword Primal idea is that every single legendary would have a chance to be used. Currently one of our biggest issue with D3 is exactly that there's so mandatory legendaries so we don't have to think almost at all. Imagine Pandemonium Loop ring to drop with a rune that fullfills a runeword and then you actually might change your build with a Pandemonium Loop which now wouldn't be the case. After that, you would start to look gear that Fears the monsters and so on. At least the idea is definitely something worth considering. The much praised D2 had so rare items that I never get them. And that's ok as it is what ARPG's are supposed to be: there should be always a small chanceto have something exciting behind the corner. Now we don't really. Preface: Many answers have been condensed, shortened and paraphrased. If you want the full context of everything, please go watch the video. No talk of launch date or pricing. How much of the D2 necro in the new necro? “Absolutely!” A massive undertaking but shaping up well. How will you make sure the Necro is different from the WD? One way is thematically, darker overall with the themes of bone and blood. Doing some very different things with pets, all are controllable to some degree with where to attack, what to focus on etc. Recently been messing around with different resource models i.e. with corpses and other abilities having blood costs. How will all the corpse based skills work since crits destroy corpses? Different than how things work in D2. A corpse mechanic had to be evented for the necro to use. Will there be aspects of the Poison skill tree from D2 integrated into the D3 necro? Not right now, encroaches on the WD. Not that many cool Poison skills so it isn’t going to be brought forward. Any love for melee-mancers? Would like to fight along pets. A lot of skills are up close and personal, and want to deliver on a close-range fighter style. Will Iron Maiden be brought forward as a skill? No plans to bring it forward, was decided that it wasn’t a fun gameplay style and that other skills could be used to fill that space. How many summons can a Necro have? “As many as Julian and the tech team will let me have” More server performance concerns than client concerns, but no defined number as of yet and no plan to set a number. What are the weapon types that necro can weild? Anything not class specific or bow or crossbow, will have their own class-weapon; scythes. “Yep, it sure will” Been working on them to see which ones they liked and which ones worked. Working on new golem types. How many types can be used? There are currently 3 worked out with room for 1 or 2 more, so 4 or 5. Will the Necro do damage itself or is most of the damage from pets? It can go both ways with pets doing most of the work or the necro itself doing the bulk of the damage. Many different avenues being developed. Yes, there will be two-handed scythes. Will the Necro minions be temporary or will they be “permament”? There will be a variety of pets, some temp and some perm. Skeletal archers and mages will be making an appearance. Build a necro based solely on blood abilities or will pets have to be involved? They’ve started fleshing out something like that as it is a strong theme. Will the Necro start with four sets? Yes, that is exactly the plan. Not entirely sure what they will all do yet. Does the Necro have things that will do self-damage to deal damage? Yes, it’s turning into quite the thing and is becoming its own playstyle. Will the Necro have burst or will it be all dot based? Necro has nothing that is dot based right now, no dot spells. Everything is nukes, pets and cool utilities. It’s a way to separate the WD and the Necro since the WD is heavy dot based. Will there be further updates posted? Short answer is yes to keep everyone up to date. No cadence for updates right now but plans to show how things are going. Totally will. Was part of the Blizzcon demo. Massive snare and debuffs damage dealt by enemies. Special form for the Necro? No plans to do anything like that. Army of the Dead was a much cooler form of a longer cooldown ability rather than just matching the other classes. Not a mandatory requirement for classes. Damage only or decent support options? Don’t design explicit support options, but the Necro does have powerful curses and other things that can help groups out. Necro same release time for PC as console? Yes, goal to ship all platforms at same time. In the lore is this the same Necro from D2? No, nothing different than the standard UI. However, a lot of the pet skills are very active in the way that they are used, and passively give you the pets. Necro part of RoS or as separate DLC? The Necro is a separate standalone pack, but as far as they know will require RoS to have. There is an FAQ on the battle.net site that has more information. Will necro be part of the group meta for GR? Absolutely hope so due to the unique mechanics that it has. Curses can fit into that role. Hoping that they will be able to fluctuate roles and use a variety of playstyles. Will Necro have its own set dungeon? Yes, with four sets there will be one for each. *Will there be life steal skills? * Yes, a lot of the blood skills will cost health along with essence so there are a lot of recoup health mechanics built in and can be used to benefit your group. Will Lidless Wall become a necro item? Maybe? Haven’t thought about it yet. Itemization usually comes later in the process. Anything else out there that look like they would be perfect for the Necro? All of the new stuff that they are developing, but not sure how much of the existing stuff will be converted to become a “Necro item.” Still finishing off skills and runes. Any challenges that have been faced so far? Julian – Revive: The game has over 1000 unique monsters and for Revive to work each of those could have 6 different varieties, so it’s going to be the most lavishly expensive skill to make bar none. The reason to do it is because it’s awesome! Travis – Corpses has taken a lot of time in figuring out how they work. Lot of challenges at the start of development and how to handle with the flow of gameplay and how the interaction works with corpses? Julian – There was a lot that went into how the corpses actually look and how they are identified on the battle field. They decided that the corpses should look all the same and behave the same to prevent issues with “saving” certain corpse types and making them easily identifiable. How do you handle the situation of no corpses at something like the rift guardian? There will be ways to make this work. Travis – Really excited when it was announced that we were doing the Necro. Been a joy taking the thematic elements from D2 and adapting them to D3. Excited to have it in the hands of players. Julian – It was the day before I go on vacation when it was announced internally that they were going to work on the Necro and I wanted to make it absolutely clear that I WANTED TO WORK ON THE NECRO. I was sending emails while on vacation to make sure I got the point across that I wanted to work on the Necro. I’m really excited about the golems since we have sort of double-downed on them and spending a lot of resources on them to make them cool. didn't read the whole thing yet, kinda don't know if i need to given that they don't talk about price and release. okay, read it. jeez. Q&A. many Q, few definitive A. "don't know yet", "maybe", "that is the plan". as it stands now, they don't seem to have anything really working. Hi guys! We're back with updated guides for season 9. We apologize for the technical difficulties experienced last season! Transferred to a new server for this season. Boyfriend spent the last 3 months learning to manage our own linux server! Forgive us if there are any poorly implemented visuals that still exists in the site. S9 Info free sets, conquests, what happens to your character after season. Minor tweaks here and there, clarified some things about leveling and Leoric's Crown. A step by step guide on how to quickly progress your character to get your Haedrig's Gift asap! It starts off with builds and recommendations for each 0,2,4,6 pieces of the free set, followed by how to most quickly and efficiently gain power from there. were done with only yellow items +4pc. NO pylons, NO legendary items or gems and No Paragons. It's an easy spread of GR20's this time around. Only Might of the Earth posing a tiny challenge. For a complete listings, check out our build at Diablofans/brgprincess - official TeamBRG Dfans page. Seasonal power ranking and comments. These are loose predictions, I can't test them all to the highest level. Think of it as a rough barometer. Crusader: Thorns Variants = Lights > Roland > Akkhan. If anything, I wish to believe it beats thorns purely on the premise that I’m sick of thorns (LoN, I love Invoker). LoN & Invoker can break the 90’s. Lights can definitely get into the high 80’s, maybe more? Roland is still subpar, Akkhan's on its own is not counted. Barbarian: Wastes >= Raekor >= MotE > IK. Can Wastes really hold up? All of the sets have high power levels now, which is pretty good for the class. I’ve seen all sets put up 90+ finishes. Of course IK by itself if not counted. Demon Hunter: FoK & LoN Variants > UE >= M6 > Sm >= Nats. UE is still the absolute king of general purpose builds, as you can use it for farming and GR’ing. I’ve seen 90+ with FoK, UE, M6 (I think M6 may be more stable than UE in higher GR now..), and S2M2. I’m sure Nats can get 80+, and pure Impale can definitely break 80. Monk: Raiment > Uliana => Inna > SWK. Raiment still wrecks. The Inna buff actually makes me hopeful for its variant builds, which are good for midtier play. SWK is my personal choice for WORST GR SET, but best farming set by a lightyears. Raiment can pass 100, Inna. I’m sure can break 90. Uliana and SWK can definitely break the 80’s too. Overall a good spread of many viable choices! Witch Doctor: Bats+Emptiness variants = Garg variants >= Jade > Zuni. All builds are pretty good. Bats and Emptiness is hard to beat but hard to solo with. Gargs are still good. Jade can actually break 90. Zunimassa can actually pull some amazing DPS, but I haven’t seen a tryhard in recent memory. All of the sets are pretty strong. Wizard: Archon variants (FB > TRE > Vyr) > Twisters > others. Since pretty much every non-Vyr set can use many similar builds, it’s hard to rank it by set. Archon is still the undisputed king, capable of 100+ clears. While all we see is Firebird these days, I’m pretty damn sure TRE and Vyr can step into the world of 90’s. Annoyingly, the “Jank” builds can tackle 80+ surely using any of the strong wizard weapon pairs. Complete a TXIII Rift in under 5 min. You're going to need to complete at least one set dungeon and master one dungeon to get to the stash tab objectives. Click on the links for our set dungeon builds: Builds in Dfans | Set Dungeon Guides. Here’s the list for this season: This is roughly arranged in the order in which I would do them. Honestly, the first four, Curses > Avarice > The Thrill > Speed Demon, are roughly equal in difficulty. we got a good easy spread of conquests this season! Curses! Star Align - Kill 350+ monsters in a Cursed Chest event. Avarice Avaritia - Reach 50M gold streak outside the Vault and Inner Sanctum. The Thrill Super Human - GR 45 without any set items equipped. Speed Demon Need for Speed - Beat Neph Rift on TX in under 2 mins. Sprinter Speed Racer - Complete campaign in under 1 hour. Well, that's about it. If you have any comments or suggestions, please feel free to leave your comments below! dpw2atox posted a message on So, how do you feel? Honestly this is pretty interesting stuff, the whole 2 new zones thing has been done before and it's fun for a bit to at least get a change of scenery in such a static game like the d3 world. Honestly I'm most looking forward to the anniversary patch as that looks to be loads of fun and I'm looking forward to playing a Necromancer again......I never got into the WD and it'll be fun to play a Necro for a new seasonal character. I don't know though exactly what their "real" future plans are for the Diablo universe and that is a little disappointing......I was hoping they'd either go all in with an expansion or just surprise us with a D4. An Exp 2 would have been nice because it could have done some major changes to the game and really made it even better. They could have really tried to fix the core issues remaining with D3 and really made the game shine. A D4 could have started from scratch with everything that worked in D3 but removed all the crap that just didn't work. Instead they seemed to have continued with the previous development cycle of a little additional content which leaves us in a limbo wondering what else is next. I'm still hoping they'll provide some more details later today about the future of the game but for now I am content with the current announcement and it has given me a reason to reinstall d3 and play again for now. HanSolo1884 posted a message on So, how do you feel? No one is mad about what we are getting, we are mad about what we are not getting. Necromancer and 2 new zones in about 6 months is not nearly enough. I said exactly what you said "The announcement is not what I wanted but I am not mad at what we are getting." It is more than 6 months for the pack. Again I said the Diablo rebuild in Diablo 3 was a waste of time. Some cosmetic items to celebrate the anniversary would have been perfect. Hell they could have made it DLC (5$). TO put there resources into the remake and not into the quality of life changes is the problem with the new content. It is so far out for so little that is the problem. OptimusPrime posted a message on Question: Why would you even want a D4 annoucment at Blizzcon 2016? I'm asking this question for community feedback for a new, upcoming Diablo 3 podcast that will feature questions posed to the community and critical thinking about each topic, rather than just idle chatter about the game and news. So I put it to you - why do you want a D4 announcement? The main rebuttal I have is if a new game is announced in November of 2016, given development time for something new and ground breaking in the ARPG/Diablo franchise, you are looking at a potential release somewhere around 2018/2019. That's a very, very long time to wait with only D3 as your companion and patches, etc to keep you entertained. To which, imo, NO one would be satisfied any longer with D3 when the next newest thing is around the corner....a very, very, very long corner. Why do you want an announcement for a new game so early - what will keep you satisfied to play D3 for two to three years while you wait? Bagstone posted a message on Paragon 10000! UPDATE2: Apparently, paragon starts scaling exponentially again - after level 2250. Updated chart at the bottom of this post. However, paragon 750 to 2250 are still unchanged and relatively easy to get, and provide a ridiculous benefit; and even beyond it's not super crazy scaling, though much more difficult than on PTR and pre-2.3. Despite this small bandaid fix to insanely high paragon levels, all the issues (and potential solutions) of this thread are still valid. UPDATE: Some of the issues in this thread have been addressed as paragon continues to scale linearly after 2000. Nevertheless, paragon is still an issue and, depending on how long season 4 will last, will be an even larger issue as it was in season 3 due to the fact that XP gain will even be more inflated. The core issues are still relevant, and the solutions proposed should still work. 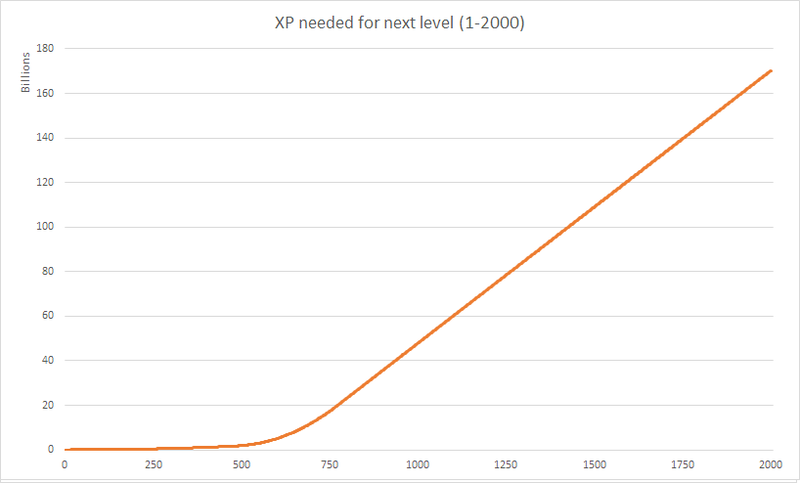 Note that CAPPING paragon is not really a solution - better would be to either 1) let it continue to scale exponentially after 750 (best solution), or 2) remove XP gear (it's the same as MF gear in D3V), or 3) lower the benefits paragon gives after level 800 (probably the best overall and feasible solution as it also works retroactively on non-season). Yay, catchy title! Sorry for the buzzfeed style, but at least I got your attention now. I previously made a thread about my concerns regarding paragon. There was also a nice thread on Reddit by Xabster highlighting an issue with paragon scaling. However, since yesterday we have new data as Kalmah raced to paragon 10000 on PTR using the GR glitch (live on Empyrian's stream). As it turned out, that changed the game once again - because the paragon XP charts we used so far (including Xabster in his post) were off. 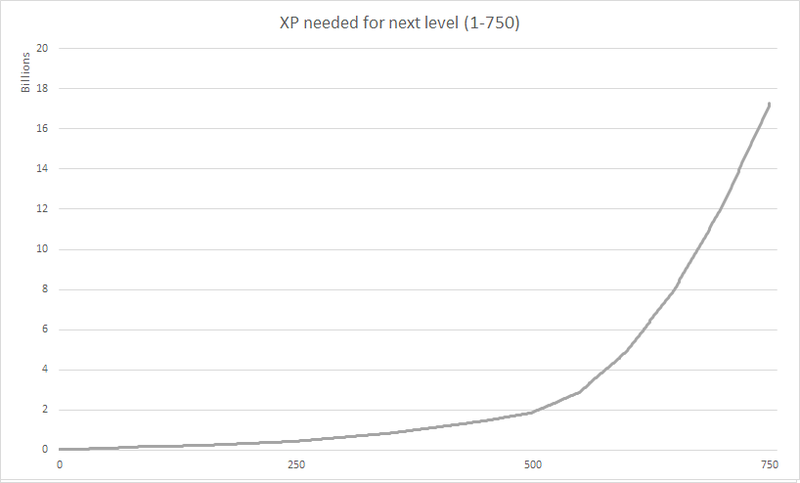 After reaching paragon 2000, every level requires exactly the same amount of XP - approx. 170 billion. 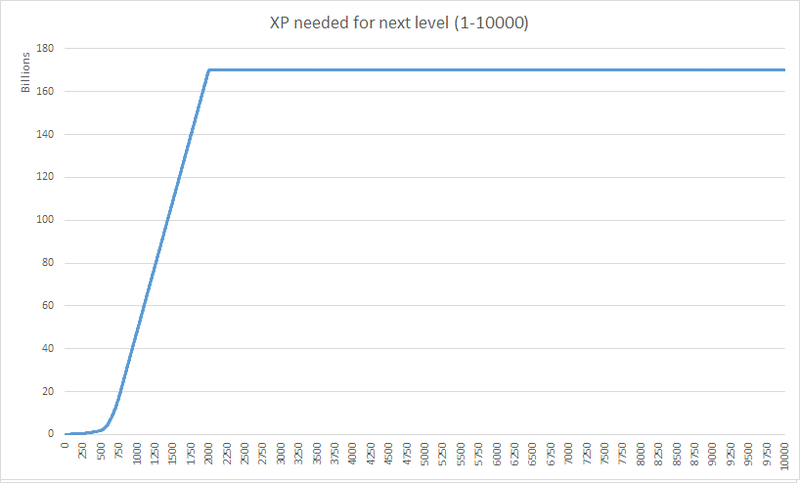 Yep - paragon level 2000 to 2001 takes exactly as much XP as 9999 to 10000. Now, in all those paragon threads many people said "I don't care". If that's the case, and you don't like numbers or charts then just stop reading and don't bother replying, there will be nothing in here for you. Otherwise, hear me out and read on. After level 2000, the paragon needed does not increase - as aforementioned. It will always be 170 billion. Now, why is this an issue? Simply because you will *increase your power* - more paragon, maybe occasionally even more gear, more DPS/toughness which allows for even more XP, higher GR clears which result in higher gem ranks. Paragon leveling will be faster and faster - but the paragon XP required will be the same. When you're paragon 2000, you need probably a bit more than one hour to get one level. When you're paragon 3000, you will have 5000 more main stat (!!! ), which means 5000% more damage - granted, it's additive damage; but it will still make you much much stronger and let you farm faster. What that means: the higher paragon you are, the more powerful you are, and the more paragon you will acquire. "Paragon per time" (or "power per time) will not be an exponential curve anymore in Diablo - as it has always been - but it will be a bell curve. Once you're at paragon 2000, you are definitely on the lowering right slope of the bell curve, and you will acquire more power as you go on, and you will not slow down but actually get faster in acquiring this increased power. Problem 1: Paragon leveling becomes slower and slower until 750, stays at approximately a steady pace from 750 to 2000, and becomes even faster after that. Solution: It should continue to be exponential after 750, and especially after 2000. It cannot be that the power creep is even exacerbated by a bell curve - that simply has to be a design flaw. It doesn't necessarily need to be as crazy exponential as before 750, but as players gain more power it should be harder to get *even more* power. Problem 2: Paragon levels after 800 are more rewarding than any before. Solution: After paragon 800, each additional level should only grant 2 main stat (instead of 5). After paragon 1000 - up until 10000 - each additional level should only grant 1 main stat. That would still mean a paragon 1000 player has 400 more main stat than a paragon 800 player, and a paragon 2000 player has 800 more. On this level, those differences matter - especially in season 4/era 4, where top-level players will all have very similar gear thanks to the cube. But at least with a bit of skillful play and luck in GR RNG you can make up for it, and aren't straight out of the competition. Alternative solution by Skelos_bg: "Cap the bonus from stats at P800. Turn the points after P800 in a currency: With this currency the dedicated players who reach P1k, P1.5k, P2k etc can buy special cosmetic rewards, more stash space etc..."
I love this idea - I would kill for stash space. The option to have one more stash tab every 200 or 500 or 1000 levels or whatever would just sound amazing and, although I dislike paragon leveling, would have me leveling like a mad man. Plus, it wouldn't break the game for anyone else if I'm paragon 5000, but at least I don't have to re-farm all gear when I want to experiment new builds. Thanks! Problem 3: Greater Rifts, especially low GRs for speed runs in 2-4 minutes, are too rewarding and pigeonhole competitive players into a very specific, tedious, time-consuming, and (in many people's opinion) boring gameplay. Solution: Make XP gained similar in all aspects of the game. This low GR speed madness only started after the XP was changed to be multiplicative in GRs. I guess this was done because T6 was more effective for XP than GRs (I don't really remember, but I think that was the case), and it gave people a gearing choice (Hellfire Ring or Stone of Jordan? Diamond or Ruby?). However, this means that you want to run GRs only (as it currently yields about 10 times more XP! ), and you want to run approximately 20-25 levels below your "real power level", as you can afford to give up DPS for XP gear on at least some characters in the group and run this at an insane speed which yields the best XP/hour. Basically, if this game's rules would apply to football, it would mean that Champions League players would have to practice 10-16 hours a day against mediocre low-league teams to become the best players. I'm not sure that would be fun for either side. The concrete solutions here would be to reverse the multiplicative bonus XP change - or even better, get rid of XP bonuses on gear (just like you did the absolutely right decision by basically removing magic find). So I'm rank 1 paragon NA now at 3130 by playing 16 hours a day on average. Got Rank #1 4 player and 2 of my team got banned so I guess my 4p clear should be removed? Absolutely. Reasons have been outlined in this thread shortly after the post that incited you to give such a response. Continue on for further explanation. It's not the players job to be the botting police lol. First off: I could be wrong but I don't think anyone was implying it was a responsibility, however you can refer to what Bagstone stated earlier about top players running in groups. I absolutely agree what he had to say. Secondly: When someone with as much popularity/notoriety as yourself makes it a point to broadcast their play sessions to the public (and respond to the community even though no one was implying you were a cheater as far as I can recall) then yes. You should be taking into consideration what kind of players you're running with. The root problem is the paragon system giving too much bonus damage to anyone who can and is willing to play all day, everyday. This has already been addressed in several discussions how it's irrelevant to the ban wave or botting in general. If anything botting makes the game better. In some ways I agree, but nothing excuses cheating. Also, you do realize how bad this makes you look right? It implies that you advocate/participate in/practice botting. You should be able to play this game 6-8 hours a day and not feel like you are at a huge handicap because you are doing 70% less damage than the top paragon players. You get out of the game what you put into it. If you have to cheat to get more out of it then you are in the wrong. If you are comparing your accomplishments to cheaters then I suggest you avoid that like the rest of the legitimate players. Not only does this make people feel like they can't compete but it also splits the player base where groups of people only play with others around the same paragon lvl for efficiency reasons. In a hypothetical scenario where botting and cheating doesn't exist, people will always seek to play with those of equal skill. When it comes to video games based around gear and stats those two factors will always affect the initial impression when deciding when to play with someone or not. There is no way around it. I hate to speak the truth but you guys think this ban wave fixes the game are wrong. Fairly certain (could be wrong) that that was never expressed explicitly nor implied. In fact most here are stating they are glad it happened and it's a good way to respond to the concerns of the community. With all that said, you probably should have kept your thoughts to yourself. I considered you an OK guy and a legitimate player until you posted this. I still think you play legitimately, but then again I'm not going to watchdog you and I don't really have much time to pay attention to streamers in general. However, I was expecting a little bit more intelligence from you. A game that's designed in a way that you don't agree with doesn't mean it's flawed and it never excuses cheating. But everyone is entitled to their opinion I suppose. I have also compiled the full tables for Dmg and XP scaling in patch 2.4 + 2.4.1, but unfortunately I can't figure out how to make proper tables on Diablofans. You can find the full lists in my Reddit post here.